Some fish make sounds by grating their teeth and others, like some catfish, make sounds from their air filled swim bladder. 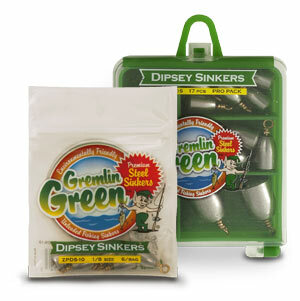 Water Gremlin’s Premium Steel Dipsey Swivel Sinkers are named Gremlin Green and are one of the true environmentally-friendly sinkers on the market. Premium Steel Dipsey Sinkers are another versatile sinker from Water Gremlin because of it’s ability to swivel on the attached looped, brass wire. It can be used for all types of fishing but is most commonly used for trolling or bottom fishing with live bait. Available in Zip-Lips and Pro Packs.